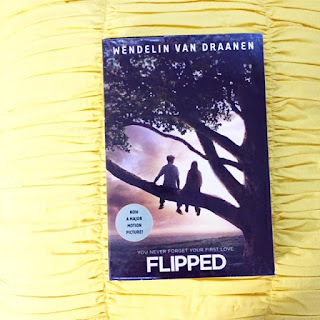 Flipped is a fun and cute story about childhood neighbors Bryce Loski and Juli Baker who, over many years of avoiding the other like the plague (Bryce from Juli), pining for the other (Juli for Bryce), and living just a few feet from each other, discover important lessons about love, life, and family that will last beyond the neighborhood. The Loskis and the Bakers are neighbors. But where the Loskis appear to be a well-to-do, organized, and typical family, the Bakers are the opposite: their lawn is a mess, their house is in disrepair, and they could barely get by. The day the Loskis move into the neighborhood is also the first time Bryce and Juli meet – and it was an eventful meeting. Although Juli is clearly smitten as soon as she first lays eyes on Bryce, the feeling wasn’t mutual. Bryce didn’t like Juli at all, and Bryce has since then spent most of his days dodging Juli, which wasn’t easy considering their proximity and the fact that they were classmates in middle school. Also, while Juli was the quirky, fun-loving, free spirit that she is, Bryce was more withdrawn and did not like the attention that Juli was showering on him. Their story is told alternately in Bryce’s and Juli’s points of view, which allows the reader to perceive certain situations from their respective angles. I liked it because, as we know – and especially with kids – there’s always a lot of room for misinterpretation. Between Bryce and Juli, I liked Juli more. She reminded me a lot of Stargirl, who never had a care in the world about what people might think of her – it’s just that she was her own person, and she was comfortable in her own skin. Juli, in a way, was like that. She was principled and loyal, she stood up for the things she believed in – but she was also adventurous, kind, honest, and true to herself. She liked Bryce and had no qualms showing him this affection – even when she knew she was getting nothing in return. If there had been a Juli in real life, I would definitely love to be friends with her. On the other hand, Bryce was aloof and seemed oblivious to a lot of things around him, which wouldn’t be half so bad if it weren’t for the fact that these were important things he was unaware of. He sees Juli as a nuisance to him and his family, he fails to appreciate Juli’s kind deeds – and he learns his lessons the hard way. But at least he learns, and he acknowledges his mistakes. What I really liked about this book was it tackled some relevant, "grown-up" things that kids these days - much like Bryce - are either totally unaware of, or just choose to ignore. The Bakers didn't have a lot to go by in terms of finances and it was because they had chosen to devote a large part of their income to something - or someone - else that's far more important. This is why Juli's chicken's eggs were so valuable, why their lawn was a mess, and why they couldn't afford the smallest bits of luxury. This situation just shows how little we know about people if we don't go past the surface, that we shouldn't judge anyone based solely on appearances. I think this theme is prevalent in the entire novel, if one would care to analyze prudently. But there were also a lot of adorable moments in the book that made me smile. Really, this book is just cute and fluffy, and so easy to read that I finished it in a couple or so days. The ending wasn’t definite, so I think there’s room in there for a sequel. I wouldn’t mind reading that one, too!